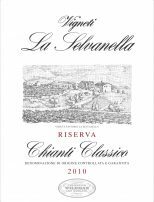 La Selvanella Chianti Classico Reserva is Fattorie Melini’s top wine. Debuting in 1969, La Selvanella was the first single vineyard wine from Chianti and one of the first to appear in Italy as a whole. Since then, this wine has been a veteran of Tre Bicchieri, receiving the honor in the 2000, 2001, 2003 and 2006 vintages. Terroir: The La Selvanella vineyard, one of the best crus in the Classico area, consists of 123 acres within the commune of Radda, halfway between Panzano and Volpaia. Planted entirely to Sangiovese Grosso, the vineyard is Guyot and cordon speronato-trained and sits at 1,300 feet above sea level with southwestern exposition. The terroir is a mixture of soils dominated by alberese, weathered sandstone. Vinification: Harvest takes place in early-to-mid October with only the healthiest bunches being picked. The must is traditionally vinified with a long, cool maceration over a period of 20 days with frequent pumping over the must to extract more color, aromas, and body. Fermentation takes place at no more than 81ºF and is followed by malolactic fermentation. The wine refines in French oak cask for 30 months and then rests in the bottle for a minimum of 12 months before its release. "Frank and forthright red fruits offer a very attractive, glowing ripeness – making this an enticing glass of wine. Poised and lively fruit on the palate with plenty of bitter notes to provide a cleansing mouthful, plus accessible acidity. Drinking Window 2018 - 2021."